Just over a year ago, I began my walking meditations in the morning. I went outside and “walked” my prayers, because I needed to remove my head (read: my ego) as the primary operating system for my spiritual life. My mind, intellect and will had taken me about as far as they could go on that journey. I had knowledge; I had discipline; I had something to show for all my hard work: hundreds of pages of prayers and journals and an annotated reading list a mile long. But the fact of the matter was that little to none of this “spiritual” work was actually reaching my spirit any more. So when I had an opportunity to ask a wise woman how to change that, she told me to take a hike, literally. And so I did, every day, for months. And my head was happy, because she still got to be in charge of directions and my heart was sad, because she had to actually feel what I was feeling. Instead of watching from a distance, my heart experienced disappointment, frustration and sadness. Sometimes, she felt lonely and confused. Previously, I could direct those emotions to my head where my ego would take over, fix the glitch and reason it all away. Our hearts have no such tools. To contain the paradoxes of our lives, they must soften, expand and adapt. In our hearts, we discover that our lives are not something to be solved, but rather something to be lived. By placing my head beneath my heart, I knew pain, but I also experienced authentic joy, connection and wisdom. Switching the GPS for my spiritual journey from my head to my heart had some unexpected fall out. Simply put, I felt lost. All the maps I had used were obsolete; my best shortcuts took me to dead ends and dark corners. I could no longer get where my ego had been telling me I needed to go for the first forty years of my life. I didn’t realize it at the time, but my final destination had changed. I had always thought of my life as a journey. The ultimate destination was heaven, but there were a lot of stops on this side of the grave. I witnessed the lives of my parents and their friends. I watched TV shows and movies; I read lots of books and they all seemed to say this: Life is about having a goal. Make a plan and make progress. Go to school, get your degree, get a job. Fall in love, get married and have kids. Raise your kids, work hard and retire. You’ll die, but you’ll rise again on the other side, better than ever. In this schema, life is about forward motion. You could expect some ups and downs on the journey, maybe even some detours, but you always knew where you were headed, because you had a plan. “Life as a journey” looked something like this. 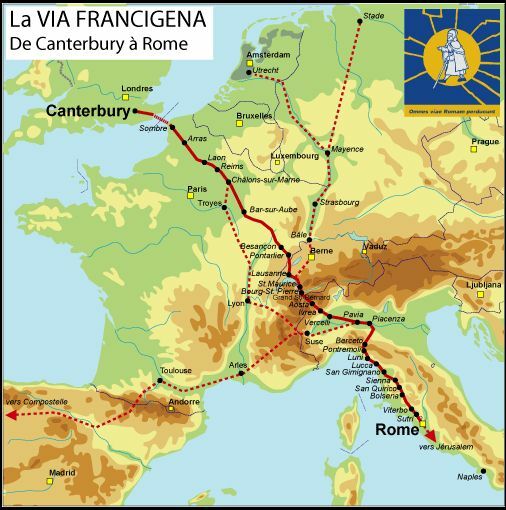 If Rome is the birthplace of Western Civilization, picture Canterbury as heaven. For a scholar of British literature like myself, it’s not such a stretch. Can you see how it works? Though the way may be far, the journey is all mapped out for you. Anytime you get sidetracked, you can just get back on the road and head to your next destination. There are lots of people with you, safety in numbers and all, so you can never truly be lost. But over the last few years, between the Great Recession, career changes, teenage children, and a dark night of the soul, the way disappeared. However, I didn’t know how to travel any differently. Even though I had switched operating systems, I just kept trying to make “progress.” It’s what our culture expects us to do. Make something happen. Keep something from happening. Set a course. Stay on course. Find a new course. Move on! I had done it pretty successfully too, but as I listened to my heart, I finally had to admit that the “life as a journey” metaphor just wasn’t working for me any longer. It’s hard to move forward when you don’t know where you’re headed. So instead of a map, I found this image to rely on. In the center of my labyrinth is God and somewhere in the midst of the maze, I am. For the life of me, I couldn’t tell you where. I don’t have a map, or a plan; I have no idea where my next stop will be, or how long I’ll stay there. However, I am also no longer plagued by the question, “Am I making progress?” In a labyrinth, who can tell? When it seems like you are at the furthermost point, you can take one more turn and walk right into the heart of it all. When you’re confident you are almost “there,” you can pretty much count on being wrong and finding yourself back in the outer ring once again. It is the way a labyrinth works. Though the image would have terrified my ego, “life as a labyrinth” makes perfect sense to my heart. I may not be able to see where I am headed, but I know I’m never lost. There are simply no wrong turns. There is only one winding path and it leads directly to the heart of God. I cannot go astray as long as I am heading in the right direction. If I ever wonder what direction that is, I simply sit in silence and stillness until I find myself pulled in the direction of Love. And if I ever get scared, turn my back and start walking the other way, all is not lost. The labyrinth is my life; I can never walk out of it. I’ve just made the walk home a little longer. *The poem is an excerpt from www.labyrinth.org.uk. 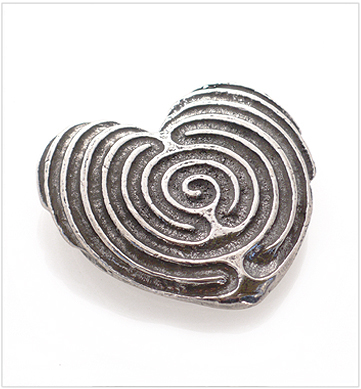 The heart image is from talented artist, Whitney Krueger. 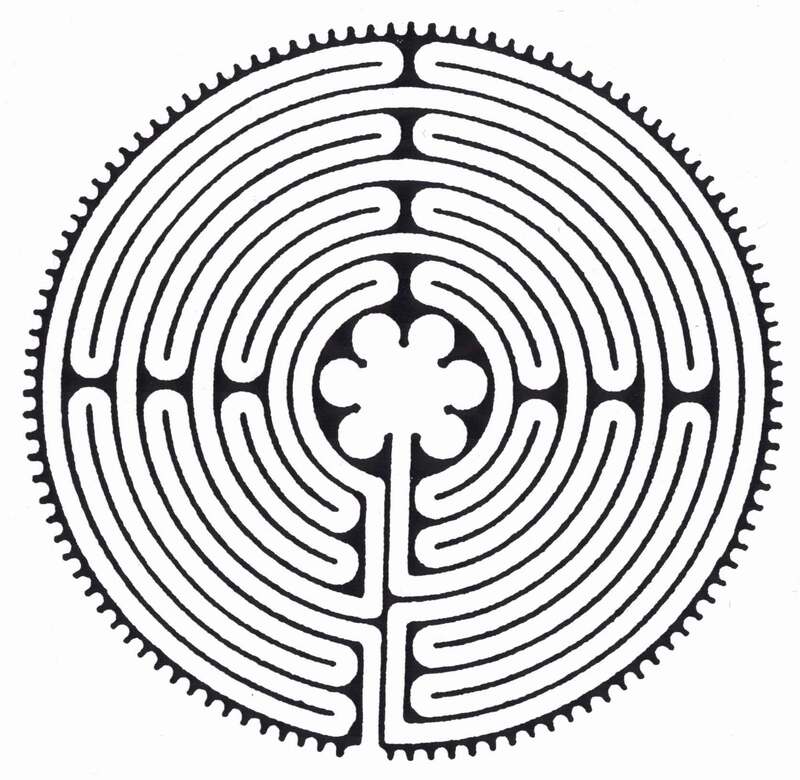 Posted in Ego, Fear, Prayer, Self-awareness, Walking and tagged as labyrinth, pilgrimage. That would be awesome Rev. Sarah. I will try to come by one day, I promise! This came to me at exactly the right moment. The journey’s structure is so different from what we ever could imagine. Letting the heart be the “GPS” is much harder to allow than the talkative mind. So true! On a journey, you can rely on your knowledge, vision and plans. In a labyrinth, you must have patience and trust the genius of the creator. Two totally different skill sets and something I work hard every day at embracing, some days with more success than others. I’m sending this to friends who have a labyrinth in their own backyard! Thank you for your eloquent thoughtfulness. Alison this is so thought provoking. Made me think of Eckhart Tolle and his words of wisdom. Thank you. I will share this with my closest friends. I’m printing this one out to share with Krystian. if as teenagers we could see the way as you describe it- a labyrinth, instead of a road going east to west with accomplishments along the way- how much richer would our lives be? Thank you for sharing! I’m printing this out to share with Krystian. If we understood this concept at teenagers- life as a labyrinth instead of life as a road going east to west with accomplishments along the way-imagine how much richer life would be. Thank you for sharing.